RIKEN and the Japan Synchrotron Radiation Research Institute (JASRI) have cut the ribbon on a new cutting-edge X-ray Free Electron Laser (XFEL) facility in Harima, the first such facility in Japan and only the second in the whole world. Nicknamed "SACLA" (SPring-8 Angstrom Compact Free Electron Laser), the new XFEL's intense beams will open a unique window onto the minuscule structure of molecules and rapid reaction of chemical species. When researchers study objects on the atomic scale, they are confronted with a fundamental limitation: they cannot "see" anything smaller than the wavelength of light they use. The new XFEL promises to overcome this limitation with light of a wavelength and intensity like none ever produced before, enabling researchers for the first time to directly observe individual atoms and molecules. To check that the XFEL is functioning properly and indeed producing this "dream beam", researchers at SACLA conducted a series of tests on various aspects of the new facility. While confirming the beam's expected intensity, the tests also indicated that the beam's wavelength, at 0.8Å (angstroms) or one ten-millionth of a millimeter, was right on the mark. Acceleration of the beam successfully reached a full 7.8 GeV, just shy of the target energy of 8 GeV. The success of these initial tests marks the first step toward realizing the dream of Angstrom-scale measurements of atomic and molecular structure, setting the stage for full-scale experiments using the new XFEL. The success is also a triumph for Japanese craftsmanship, given that many of the components for SACLA were independently designed and built by Japanese manufacturers. Pronounced "sa-cu-ra" and meaning "cherry blossom" in Japanese, the facility's name commemorates these Japanese origins, while its logo symbolizes, among other things, the "8" GeV of energy it will generate once operating at full capacity. 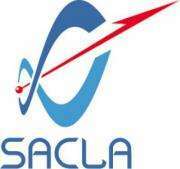 With shared use of the new facility scheduled for the end of fiscal 2011, it will not be long before researchers begin using SACLA to push the boundaries of scientific knowledge, heralding a new era of exploration and discovery.